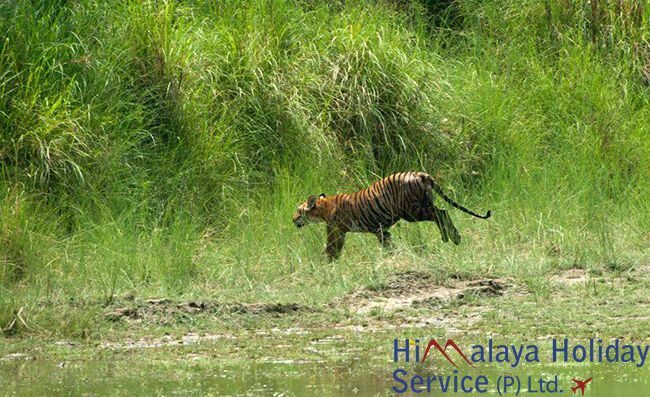 Spread over 968 square kilometers, Bardiya National Park is the biggest in the Terai region of Nepal. It is a magnificent, unscathed wilderness of grassland, Sal forests, and alluvial washes dissected by Karnali River in many parts. It is also described as what Chitwan National Park was 30 years ago. The park grieved greatly during the decade-long Maoist insurgency in the 1990s. Tourism thinned, hotels were mothballed, and wildlife suffered by poaching. However, the damage has reversed impressively. As of 2017, there are now 36 rhinos inhabiting the park. Here we have presented why you should visit the Bardia National Park. Unlike Chitwan National Park, this one hasn’t witnessed a surge in commercial development. There were quite a few underpinning factors behind it. For instance, the wrath of insurgency period and lack of easy accessibility. Today, this park is thriving and perfectly fit to host you, but you won’t come across swarms of giddy tourists taking photos in every direction. You can raft through the Karnali for hours and hours and not encounter a single person. You will comfortably find lodges to stay in even during the peak season. But don’t expect a commercial or “luxurious” safari-style vacation. If you are looking for a raw and untamed jungle experience, Bardia National Park is the perfect destination for you. Alongside the adjacent 500 square kilometers Banke National Park, Bardia National Park is one of the largest protected tiger habitats in the world. There are more than 50 tigers reported to be foraging through Bardia alone. Although the numbers are less than that of Chitwan’s, here, you certainly stand a better chance of seeing more than one. All the guides here will know the hotspots for tiger sighting like Tinkuni and Kingfisher. Be patient enough, don’t forget to bring binoculars and cameras, and get ready to have the time of your lives. The best time of the year to see the tigers is from February to May. There are three main ways to embark on a jungle safari in Bardia: a) Guided Walks b) 4WD Safari and c) Elephant Safari. Irrespective of the style choice, for a patient and keen wildlife spotter, the park offers ample opportunities. Wild elephants, one-horned rhinos, leopards, and Bengal tigers are few of the 30 recorded mammal species found here. Similarly, endangered sarus crane and Bengal Florican are among the 250 species of bird found here. Venturing through the jungle with your guide is a potentially risky but thrilling experience. A four-wheel drive safari is definitely a more convenient, time-efficient, and safe way to traverse through the jungle, but there is quite nothing like an elephant safari. The choice is yours! P.S. The dangers in Bardia National Park are very real, because it consists of a very active and rich wildlife. Make sure to always follow your guide’s instructions, and don’t ever wander alone in the jungles. A memorable downstream drift in an inflatable raft is a very interesting way to explore the park, spot wildlife, and even aquatic species. You can spot Gangetic dolphins occasionally during rafting and canoeing trips along the Geruwa River and Karnali River. There are also plentiful of Gharial and marsh mugger crocodiles to make your rafting experience an adventurous one. Walking around the sandy riverbank and spotting heavy density of animal footprints like rhinos, tigers, and elephants is interesting too. However, remember that it is not a white-water rafting, although there are few gentle dips. Tharus are the indigenous inhabitants of Bardia and its surrounding regions. Of Dravidian race, the Tharu people are even claimed to be immune to Malaria. Irrespective of that, it is very interesting to see and experience parts of their unique and rare culture. You can visit the small museum that features several indigenous artifacts ranging from farming tools to kitchenware. On the other hand, you can also visit a Tharu village for a more authentic and enriching experience. This way, you can learn more about their architecture, way of live, and intangible traditions and culture.